The Madera County Farm Bureau is steeped in history. Established in the 1940’s, many early members came from prestigious farming and ranching families of Madera County. Today, the cast is no different. Our county’s rich history still can be found just under the surface at the local Farm Bureau. In November, the Board of Directors welcomed a new board member who extends another story of Madera’s longstanding agriculture heritage. We welcome Al Sheeter, who hails from the historic Mordecai Ranch. Sheeter came to the property, known to the Mordecai family as “Refuge,” when he met and later married a Mordecai descendant, his wife, Cecelia. Now he is immersed in the history of Refuge and carries the same pride of the land’s legacy as his wife’s family. The ranch is currently ‘home’ to its 7th generation, having been in the family since the late 1860s. Before coming to live at the ranch, Sheeter’s experiences took him down a road far away from his agricultural roots. A graduate of Fresno State with a degree in English, Sheeter spent many years in the field of Journalism. 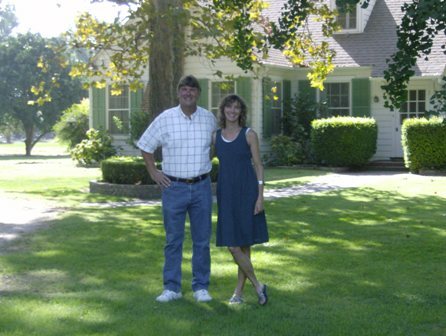 His preference for a rural lifestyle firmly revealed itself when Sheeter accepted a position at an Anaheim television station where he quickly grew tired of high population and traffic congestion, returning to the Central Valley after a few short weeks. He then worked in TV media at KBAK in Bakersfield and at KJEO in Fresno, never forgetting his respect for agriculture that began with his childhood upbringing in Delano, California. The Mordecai Ranch is home for Sheeter and his immediate family. Sheeter lives on the property with his wife, Cecelia, and his three children, Daniel (21); Jacob (16) and Isaac (12). Daniel Sheeter currently attends U.C. Davis while studying Economics, while Jacob goes to Madera High and Isaac is in seventh grade at St. Joachim. Also residing at Refuge is Cecelia’s mother, Brooke Mordecai Wissler, whose great-grandfather, a Dixon, was the original family member who owned the land. How it became known as the Mordecai Ranch is a most interesting tale. Twenty-four year old George Mordecai came to what is now Madera County in July 1868, from Raleigh, North Carolina. He settled along Cottonwood Creek with several families from the South who were also seeking refuge from Reconstruction. Together they constituted what history calls the “Alabama Colony,” named after the plantation of Samuel Strudwick, the patriarch of the expatriates. The “colonists” who were approximately 70 in number, toiled on the land for a couple of years and then began to move on to greener pastures. They had been slave holding, plantation owners in the South and were not inured to the hardship of working the land themselves. Only one remained—George Washington Mordecai—and he stayed on his land for 52 years. At first George tried dry wheat farming on a section of land near Sycamore Bend on the San Joaquin River. Then he began to court Louise Dixon, the daughter of Judge Richard Lawrence Dixon and his wife, Julia Rebecca Phillips Dixon. In 1876, they were married, and the young couple began to farm “Refuge,” a 2,200 acre ranch, which belonged to the Dixons. In 1880, the Dixon family sold “Refuge” to George Mordecai, and that was the origins of the Mordecai Ranch in what was to become Madera County. George Mordecai threw himself into making “Refuge” a showcase of early Valley agriculture. After a few years of dry wheat farming, he diversified his operation to include sheep and cattle. By 1890, he was recognized as one of the most successful farmers and ranchers in the San Joaquin Valley. Then the lure of politics caught his attention. The people elected him to the California State Assembly twice, and during that time, he joined a group of citizens who wanted to carve off Madera County from Fresno County. In January 1893, Mordecai introduced the bill to create Madera County, and in doing so became one of its most influential founding fathers. Mordecai left the Assembly for a run for the State Senate but was defeated. Although he never ran for public office again, he remained active in the Democratic Party, having been chosen as a delegate to the 1916 and 1920 national conventions. In the meantime, Mordecai continued to devote his life to building the ranch that exists today. One would be hard pressed to find a more influential Madera County pioneer than George Washington Mordecai. He was a farmer and a rancher who recognized his civic responsibilities. Today as folks drive past the Mordecai Ranch on Highway 145, they pass a real treasure that has been preserved by the descendants of Mr. Mordecai. They too are determined to continue in the footsteps of their ancestor who started it all over 140 years ago.